It’s been a huge year with some massive scores and some rubbish ones, but if you have made the Grand Final there are still some big decisions to make! So, for the 23rd and last time this season…. Let’s Scramble!! 22 weeks of footy, a pre-season that took probably around 8-10 weeks and it all comes down to this. The Grand Final! One more week to get the glory either in your league with a win or amongst your friends with a ranking. Of course there is a hell of a lot of luck in this game so even if you look like you are a massive underdog this week, don’t chuck in the towel just yet. Put your best team out on the park and you never know what might happen. So let’s not waste any more time. Let’s Scramble!!! My Team Is Fine! Why use my trades. We all know that in AFL Fantasy we get two trades per week whether we need them or not. And in some cases you may think you don’t need to use them so you don’t because you are worried about what will happen in the weeks to come. But when we get to this last round all bets are off and we don’t need to worry about that anymore. With just this week to go you can afford to make some changes that you otherwise wouldn’t and then take a risk or two to either rocket up the rankings or win that all important Grand Final. If you are in that great position of luxury trading this week the key for you will be the matchups. Have a look at who your players are up against and then use that as a guide on who you could trade out and who you could trade to. If you listened to the Traders from Monday night you would know that Calvin is planning on trading out Tom Mitchell and bringing in Seb Ross. Not only is this a strategic move based on opponents, it is a great move to get some cash to upgrade someone else you have to a better player. Whilst on the face of it this looks like a ridiculous move, I mean, who would trade out the Pig? But when you look at his last few games against the Swans you can quickly see why this is the case. In his last three games against the Swans he has scored 58, 94 and 108. Now these aren’t very Pig like numbers and it is widely expected that he will be tagged by Hewett. On the flip side you might bring in someone like a Seb Ross for him who is playing against a North side that doesn’t have their tagger Ben Jacobs and he has been in a rich vein of form lately. Now I am not saying that this move isn’t without any risk but in AFL Fantasy this move makes you just under $200k and if you have an injured player somewhere else like a Doedee you can then turn him into any defender you want really. Or you can upgrade one of the other midfield players that isn’t scoring quite so well. So this is certainly a valid strategy to use when there is no concerns about what is going to happen to your team in the following weeks. Who should I trade to Menegola between McLean and Wingard? Also considering trading Mitchell to Seb Ross as I am out of finals and just want to improve my ranking. The second part of this question is exactly what I was suggesting above, go for that move if you think that Ross will outscore Mitchell this week. Personally I think he will and I will be considering that move to free up some cash to upgrade elsewhere. As for the first part of your question. Well I think that the answer here is tricky one, neither of these guys has been performing well for us lately. On pure numbers of late you would say Wingard is the one to go with a couple of 70’s in the last four but McLean has one also. So we need to look at their opponents this week and how they score against them. In his last 3 full games against Essendon Wingard has had 58, 71 and 110 whilst McLean has only played against the Tigers once in the last three years and that was for a 69. This doesn’t make anything any easier! But if I had to make a decision I think that I would trade out McLean. With the emergence of Dunkley recently and being up against the top side and reigning premiers I think that McLean will score less than Wingard who is on his home deck on the big stage, something he loves. So trading McLean to Menegola gets the tick from me. Big decision here Troy. Clearly Rocky goes as he is not playing, but Dunkley is an interesting question. He is certainly one of the form players in the comp and he doesn’t really have a form line against the Tigers, his only score in the last couple of years was a 38 but he has a very different role in the team now. This is a situation I have written about a couple of times in recent weeks. If you are really worried about how much Dunkley will score and that he could be the reason that you lose the matchup then you should certainly bring him in to cover off that unique risk. This is particularly important if you think that the rest of your uniques are good enough to get you over the line. However, if you think that the fact he is up against the Tigers means he will put in a low score then go someone else unique and take the risk. This is the way to go if your uniques are weaker than your opponent. His recent form against top 8 sides has yielded a 104 v WCE, 99 v Melb, 109 v Haw and 112 v Gee. His big scores have come against Carlton (132), St Kilda (127) and Port (116). I can’t see him scoring more than 115 this week so if you have the ability to trade to someone who will score more than that then that is the way I would go. If not then certainly cover off the risk. But really it will come down to your other uniques and how strong they are. A surprisingly uneventful night at selection this week with not too many impacts for our teams. Here are my thoughts on the highlights. Rocky – An injured shoulder might explain some of his scores lately but we need him now to get right for next year. Cotchin – He returns this week but I wouldn’t looking at him as a trade in target. Walters – His injury gives us a reason to trade him out, however, my team would have benefited from this happening a few weeks ago. Doedee – Many held him for the season, me included, as he was just scoring solidly down back and was a trade we didn’t need to make. His injury now forces our hand. Witherden – Another injury that could cause some concern for people’s backlines. Ahern – He returns to an extended bench, with some of the injuries this week there will be a few teams hoping that he gets up. Particularly those that have run out of trades in RDT and SC. If you aren’t in a final then just go for it! Take a risk and get that ranking as high as you possibly can! Don’t stress about scores over the weekend, it is our last full weekend of footy, sit back and enjoy it. If you have trades left in RDT and SC, you may as well use them, you can’t keep them to get more next season. Matchups are the key this week, not season averages. 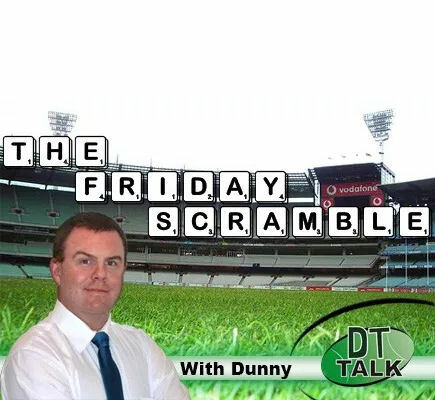 Well that’s it from me for another season, I really hope you have enjoyed reading the Scramble as much as I enjoy bringing it to you each week. Hopefully I have provided you with some assistance that has gotten your team up in the rankings or to a Grand Final. As always thanks to everyone that helps each other out in the comments during the year and a huge thanks to Warnie, Roy and Calvin for allowing me to come back again this season. Also good luck to Selby who could pull off the unimaginable and win AFL Fantasy in back to back seasons. That would just be simply amazing! Best of luck this week and I hope to see you all again next year. Mitchell to Beams/Ross (no bench cover)?? Mitchell to Ross, back the midfield in to have no late outs. Plus, with no Ben Jacobs, Ross could be anything. Any other trade you’d recommend? I’m basically banking on Tommahawk going bananas against Gold Coast. I don’t think it’s ever a good idea to “bank on” a key forward going big in a particular game. They’re not consistent scorers and they’re not predictable either! So it depends on your situation really. Are you the underdog in a league GF? If so, then maybe taking a punt on Hawkins is a cool move … but don’t rely on his performance. Key forwards are always risky. Dusty & Conigs -> Ross & sidebum? Who to trade out for seb Ross out of coniglio/Adams/ Cripps? Coniglio would be my pick.